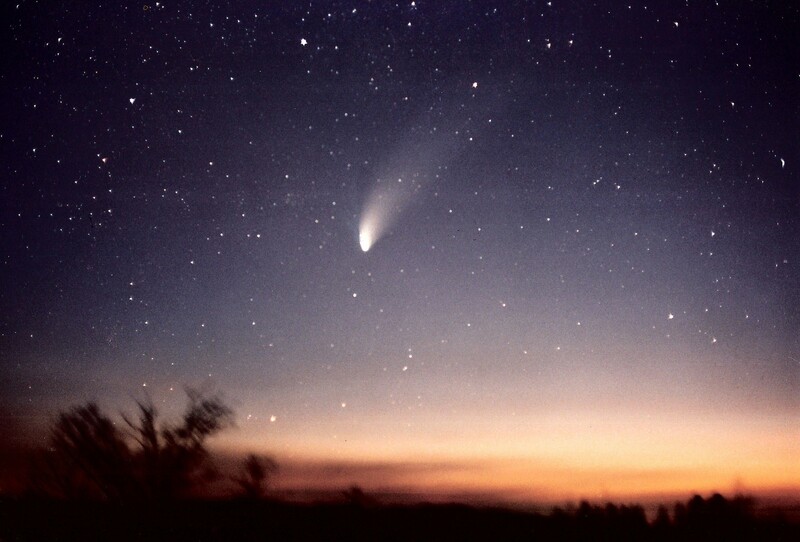 Comet Hale-Bopp was a sensation in 1997. A comet easily seen by most residents of Earth, even those without telescopes or astronomical training. Living in NH is was easily seen for nights in our skies that are free from most light pollution. Driving anywhere at night was a joy with the children, as Hale-Bopp was our companion. My friend Chip Taylor, over in Vermont, took this incredible photograph of the comet. The best view of the comet for the family came when we were returning from a vacation in Puerto Rico. The plane we were in was flying late at night, and the pilot came over the speakers to inform everyone that Comet Hale-Bopp was visible out the “left side of the plane”. We were lucky to be sitting on the left side. I wondered how hard a time the pilot had keeping the plane steady as everyone on the right side came over for a view. What happened next was rather funny. One woman became upset as she said “It is flying right alongside us!” Another man announced, “There is something funny, it shouldn’t be this close to Earth!” A mild panic ensued. It didn’t matter that there were many of us trying to explain that while Hale-Bopp looked to be skimming along beside us, it was indeed very far away. The steward was unable to answer the questions being posed to her, and the passengers had differing explanations. One steward knocked on the cockpit door, and talked to the pilot. The pilot then came on the speakers again and assured everyone the comet was indeed very far from Earth, was not on a collision course with Earth, and why something so far away looked so close. Everyone got a lovely lesson on why seeing things in the sky is so very different from seeing things on the ground. Points of reference, depth perception, seeing a bright object against an almost black background, and how comets behave were all covered. This pilot knew his stuff. We all learned why pilots have to trust their instruments and not their eyes, and why pilots are not good at identifying UFOs. They just can’t use their eyes to guess how far away something is, or even size. He also pointed out this went for people standing on the ground and looking up. The pilot in a professional manner gave everyone a lesson in skepticism that night. The slightly scared passengers calmed down and were able just to enjoy the beauty of seeing a comet that seemed to be flying right next to the plane. As a skeptic I was happy that a trained professional like the pilot took the time not only to calm his irrational passengers, but give everyone a lesson. This is something I find skeptics are good at. We all have opportunities in our jobs to educate others. While someone might not listen to me if I stood up on that plane and said “As a skeptic I can assure you that comet is not going to hit Earth.”, everyone listened to the pilot. There is a matter of trust between passengers and pilots. When I recently told a friend her mega vitamin routine was probably dangerous, she did not listen to me. However, when she was checking out all those vitamins she asked to speak to the pharmacist. The pharmacist convinced her in a few minutes she did not need all those vitamins. I had the exact information as the pharmacist, but the pharmacist had the trust on this issue. So whatever it is you DO, look for opportunities where your professional credentials will allow you to teach a little skepticism.